Be the first in your family to show off this New Pink and White Unicorn Award Winning Eyeglass Holder trimmed with purple. No more searching for lost glasses ! 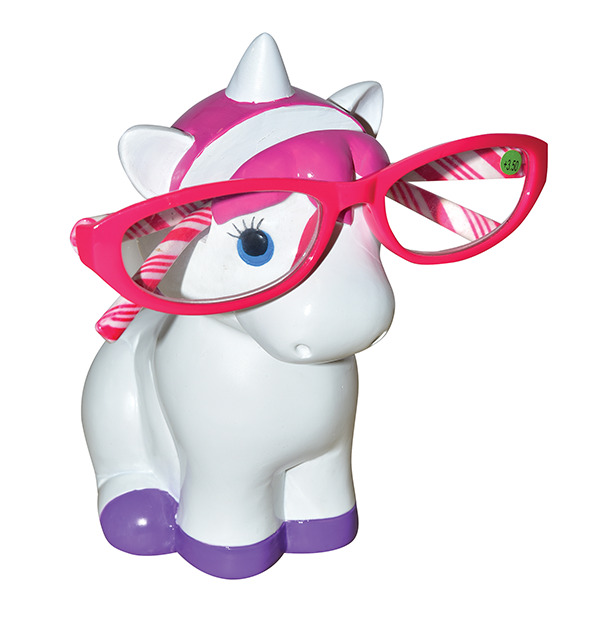 Have your spectacles at hand on this novelty Unicorn Eye Glass Holder. These novelty Unicorn Eye Glass holders hold your spectacles safely and securely in the one location when not being worn and your loose change stored away. Each colorful individual unicorn eyeglass holder is hand painted and is designed to hold all sizes and design of spectacles on the nose bridge of the nose or sports figure. These have become extremely popular with Opticians who wish to find something attractive to display their range of spectacles in their window to attract customers. Parents have found these extremely helpful when having a child starting to wear glasses for the first time, also learning them to save money too. The Pink and White Unicorn Eye Glass Holder will be packaged securely for posting.